The Commonwealth Fund is at it again with another headline-grabbing survey, putting the U.S. dead last in its ranking of seven countries' health systems. Commonwealth's bottom line: Only Canada has lower quality health care than we do. The U.S. is the most unsafe, the least efficient, the least equitable, and the worst in keeping people alive and healthy. Oh, and we spend way too much. And, of course, Commonwealth reminds us that the U.S. placed 37th in a discredited, 10-year-old survey by the World Health Organization ranking health care systems. So why would it be, then, that when people are sick and want the best medical care, they want to come to the U.S.? The study didn't discuss, for example, survival after being diagnosed with cancer, access to specialists, or investment in research to improve medical care for the planet. Is there an agenda here? Of course. The report says that "The comprehensive health reform legislation signed into law in the United States will undoubtedly ameliorate some of these problems." Do we have problems in our health sector? Absolutely. Is ObamaCare going to fix them? Absolutely not. In fact, access to timely, quality care and many other measures, including cost, are going to get much worse as a result of the health overhaul law. The Commonwealth survey is based not on actual data about the effectiveness of care, but upon "patient and primary care physician perceptions of the care they received and administered." To prove that this study should not be used as a guide, it concludes that the U.K. was second in overall rankings, and first in efficiency and providing effective care. Commonwealth might want to rethink its criteria before we are hit with the full force of ObamaCare. Broken promises: And to that point, House Republican Leader John Boehner this week released a 43-page report on "ObamaCare: Three Months of Broken Promises." The very long list cites independent reports showing that health insurance costs are rising, not falling. That health spending and the deficit are increasing, not declining. That cuts to Medicare will indeed impact seniors. That millions of people will lose, not be able to keep, their current health coverage. That burdens and costs on businesses will increase, not fall. That small businesses, the engine of jobs creation, will be hit hardest. And that the new taxes will indeed hit the middle class. The real wonder is why on earth the president thinks this legislation is going to become more popular as it moves forward. The administration's hubris in thinking they could rewrite the laws of economics and incentives will ultimately bring down ObamaCare. No hearings yet: The president's choice to run the Medicare and Medicaid programs is running into trouble with no hearings yet scheduled for Senate confirmation. Robert Pear had an article this week in The New York Times that explains why many of us believe the selection of Dr. Don Berwick is so politically tone deaf, especially among seniors concerned about big government blocking their access to health care. Long before the uproar over "death panels" last year, Dr. Berwick was urging health care providers to "reduce the use of unwanted and ineffective medical procedures at the end of life. … In speeches and articles celebrating the 60th anniversary of Britain's National Health Service in 2008, Dr. Berwick said he was "in love with the N.H.S." and explained why it was "such a seductress." "The N.H.S. is not just a national treasure," he wrote; "it is a global treasure." … Dr. Berwick offered a suggestion to the British: "Please don't put your faith in market forces." No one can deny that America's health care system is flawed in many ways. But when it comes to the standard that matters most — the quality of health care provided — our haphazard, expensive, insurance-based system towers above the NHS. That's the system that leaves Berwick feeling "romantic'' — the system he proclaims an "example'' for the United States. And Obama wants him to run Medicare and Medicaid? Let us hope 51 senators say no. Maybe someone should also tell this to the Commonwealth Fund. Major central planning for the entire health sector isn't working in the U.K., and won't work in the U.S. Even if he is confirmed, Berwick will become the poster person for the complaints that seniors inevitably will have with the huge problems to come with ObamaCare. Maybe someone at the White House should be rethinking this. Catch 22: And yet another adverse impact of ObamaCare is coming to light, trapping businesses in a Catch 22. Karl Rove wrote about the grandfathering regulations for businesses in a column in The Wall Street Journal and so did the paper's news reporters. If employers change their plans, they lose their grandfathered status that protects them against more expensive federal mandates. Among other things, [Rove] noted, a plan could lose grandfather status if employers decided to switch carriers — 'a common practice when employers shop for lower prices.' Well, yes. So what? The grandfather clause is there to let you keep your current insurance, assuming you like it and that it remains available to you. But if your employer is switching carriers, then it's not really the same plan anymore, is it? You've already lost your insurance. Obama didn't take it away from you. Your employer did. But, of course, when a carrier knows a company can switch, it has a greater incentive to keep prices low. The company needs that flexibility to keep its costs down, as the Journal reported. 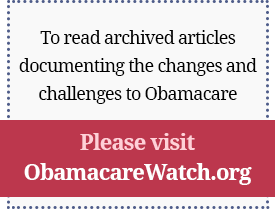 The Obama administration's grandfathering regulations traps them in the more expensive plans. They can't change without facing a battery of new (expensive) government regulations. get their increases down to 13%. Choice, competition, and flexibility are what we need, not central control and mountains of regulation. We will get there because that is what works. Galen Institute and Cato Institute Student Forum: How Will ObamaCare Affect Young Adults? Yesterday, the Galen Institute, in partnership with the Cato Institute and Students for Liberty, hosted "How Will ObamaCare Affect Young Adults? ", a student forum that focused on the higher taxes, increased premiums, and forced mandates that young people will face as a result of ObamaCare. Video from the event will be available next week on the Cato website at the link below, as well as on the Galen website and Health Reform Hub. Check back in the coming week to see the full presentation! The White House and allies such as the AARP are trying to use multi-million dollar public relations campaigns, presidential town hall meetings, misleading taxpayer-funded mailings to seniors, and other efforts to fool seniors about ObamaCare, Turner writes. But the fact remains that millions of seniors will lose their current coverage and millions more will have trouble finding a doctor to see them — all because of ObamaCare. Seniors are too smart to believe the sugarcoated message and are rightfully angry over sweetheart deals that protect special interests at their expense. The problem of covering Americans with pre-existing conditions is certainly real, but the notion that the only way to solve it is through a massive transformation of America's health care system — one that will increase costs, raise taxes, displace millions of the happily insured, create a new entitlement, and undermine our private insurance sector — is simply wrong, Capretta and Miller write. The case for repealing the newly enacted law, then, is not that there are no problems to solve in American health care. Rather, it is that there are far better solutions available. Across the country, state policymakers have turned to an approach that does not require a fundamental transformation of the insurance marketplace: the creation of high-risk pools. Unfortunately, these state-level efforts have not been sufficiently ambitious or adequately funded; they would also be badly undermined by the new federal health overhaul law. But if that law is in fact repealed, reformers concerned about the problem of pre-existing conditions should champion a system of robust, well-funded high-risk pools as a smart and effective solution. Based on Washington's record of health policymaking, ending or rolling back ObamaCare is anything but implausible, Moffit writes. The Medicare Catastrophic Coverage Act of 1988 was enacted with huge bipartisan support in both the House and Senate and repealed one year later. Enactment of the 1,342-page Clinton plan of 1994 was considered inevitable, but it was brought to a grinding halt in the fall of 1994 and collapsed on the Senate floor. In the case of ObamaCare, the president achieved a narrow legislative victory but it was achieved at the expense of winning popular support for his signature legislative accomplishment in the court of public opinion. This gives conservatives in Congress a tremendous opportunity to reshape the health policy debate. ObamaCare: To Tax or Not to Tax? The American Spectator is reporting that a Department of Justice memo calls the penalty for any U.S. citizen who doesn't buy health insurance under the new national health care law a "tax," writes Gantert. The memo was filed in court last week by the Department of Justice in response to a Florida lawsuit against the Patient Protection and Affordable Care Act. That's significant because President Barack Obama criticized those who said it was a tax in an interview with ABC's George Stephanopoulos. More employers are adding high-deductible plans to the mix of health plans they offer or using them to replace their traditional plans. Yet some insurers who offer high-deductible plans say the health overhaul law is imposing new regulations that will make it harder for them to operate, Andrews writes. Earlier this month, nHealth of Richmond announced that it was shutting its doors, saying its business model couldn't be sustained under rules that will require insurers to spend 80 to 85% of the amount they collect in premiums on clinical services and quality measures, or give customers a rebate. "In my view, this was the first shoe to drop, and I'm wondering if there will be others," says Roy Ramthun, president of HSA Consulting Services and former adviser to President George W. Bush on the rollout of HSAs. Ramthun says he's also concerned that the high-deductible plans might have trouble complying with regulations that will be set for health plans sold on the exchanges in 2014. HealthEquity, a leader in the administration and sales of Health Savings Accounts, has produced The Complete HSA Guidebook, under the direction of CEO Steve Neeleman, M.D. The 4th edition of this book provides a detailed, comprehensive description of the basics and complexities of implementing HSAs, including chapters on how to set up an HSA, a consumer guide to paperwork and recordkeeping, and the HSA law. he Medicaid expenditures for LTC, in both institutional and community-based settings. If the current trend continues as demonstrated in this paper's base model, more than 35% of a state's budget will be needed for Medicaid by 2030, of which half will be for LTC services. The paper also examines how the health overhaul law's mandate for increased access will worsen Medicaid's expenditure trend. While the law states that new Medicaid enrollees will be subsidized through 100% federal funds from 2014 to 2016, state budget deficits are projected to be more than $350 billion between 2010 and 2011, a dangerous fiscal scenario for which there is no short-term solution. Measures of Efficiency in Healthcare: QALMs about QALYs? Professor Schlander's critique focuses on the highly restrictive approach called cost utility analysis, using cost per quality-adjusted life year (QALY) benchmarks. Agencies concerned with health technology assessments and/or pricing and reimbursement decisions in many countries, including Australia, Canada, and the United Kingdom have embraced cost effectiveness analysis and the use of QALYs. Yet, key underlying assumptions regarding QALY benchmarks are probably wrong and may lead to potentially very misleading recommendations. For example, the U.K.'s National Institute for Clinical Excellence (NICE), which develops guidance on the use of new and existing medicines and treatments, insists on the use of QALYS. The cost effectiveness benchmark used by NICE has been subject to debate and it has been proposed that NICE should be seeking (more) systematically for an appropriate threshold rather than merely assuming one. For more information, please contact Sterling Meyers at sterling@galen.org.